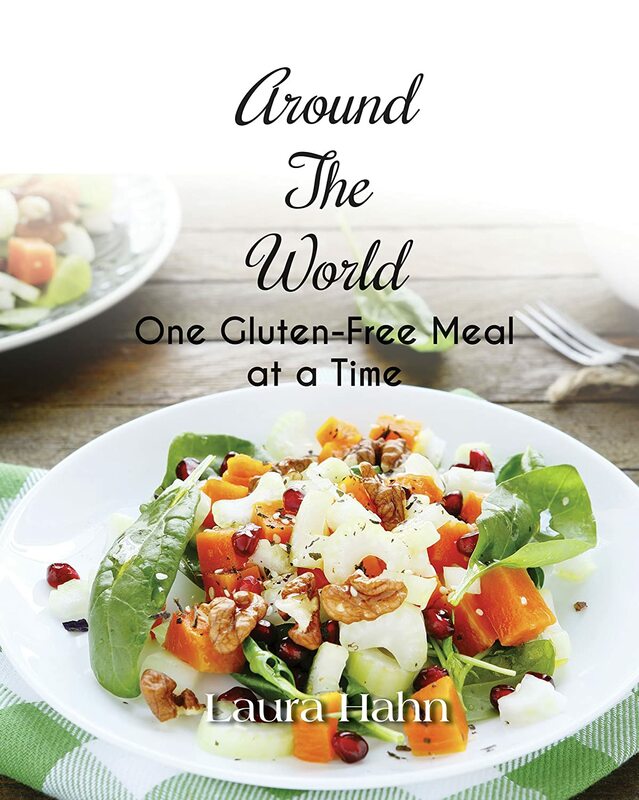 As I continue to discover new gluten free recipes its important to talk about one of my favorites. 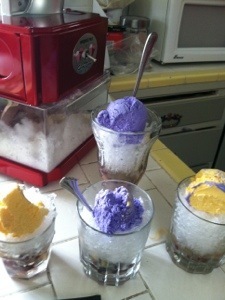 Halo Halo is like a Philapino ice cream Sunday. After a recent trip to San Francisco I had a hands on cooking demonstrations on how to make some of the best Philapino recipes from Aunt Bing. Halo Halo is to good to be true and is something I always look forward too. Feel free to be creative with this one. 1/3 Cup Sweet Beans- the best is to buy type if dessert beans at an Asian market. If that not available the you can slowly rehydrate beans in a sugar water solution. 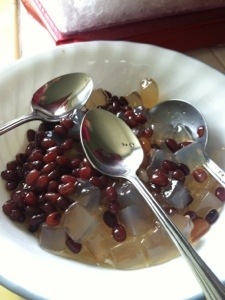 1/3 Cup Jelly Cubes- This is another item easily found at an Asian market. Or make using a basic jell-o mix with half the water and set in a shallow baking pan . Once set, cut into cubes. 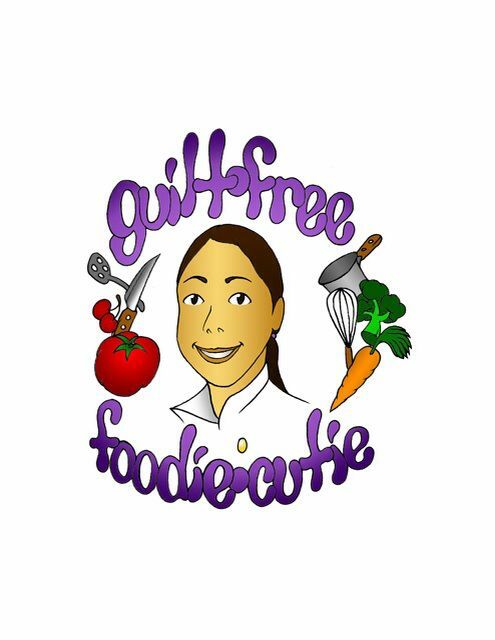 1/2 Cup Ube or Jack Fruit Ice Cream- this can be substituted for mango ice cream if needed. Start by finding a fun clear glass. Place ice on bottom for the first layer. Next, place beans and cubes of jell-o as second layer. Then pour condensed milk on top. Top ice layer with scoop of ice cream. Finally sprinkle with rice cereal for a touch of crunch. Serve immediately and enjoy!!!! Fall is my favorite season of the year. I love the weather, the foods, apple picking, the colors of the trees. Every year Jay and I make it a point to have one full day doing fall fun things. This year we went to a scarecrow festival, wineries and apple picking!! With the ten pounds of apples and the gallon of cider we returned with be prepared for a lot of apple related recipes. Since the weather is still warm I came up with this one. A super easy treat the whole family will love. 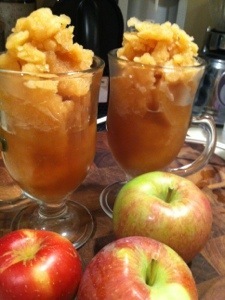 All you need to do is toss cold apple cider into your ice cream maker and run for about 10-15 minutes. If your don’t have an ice cream maker then freeze the cider in ice cube trays. Place frozen cups in a blender and blend until they form a snow. Optional – For adult, pour over 1 oz of rum to slush for a festive cocktail. My boyfriend likes to challenge me with his dinner requests. 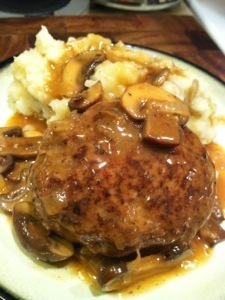 This time he wanted a classic Salisbury steak dinner. Since the store stuff is not gluten free I had to get creative. It worked out great! Start by chopping the onion and garlic as small as possible. Brown the onion in a large pan with a little spray or oil. While onions are browning place ground meat Ina large bowl and combine with egg, pecan meal, tamari sauce, 1 tsp salt, 1 tsp pepper, oregano and parsley. 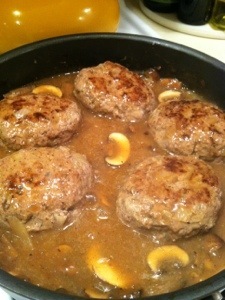 Once onion and garlic is done add half the mixture to the meat and save the other half in a bowl. 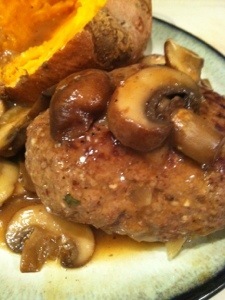 Mix up the meat well and form five oval patties. Return pan to heat and brown each side of all meat then remove. Your not trying to cook meat completely. Now, in the pan with the drippings add the mushrooms sliced and the onion. Cook with down with a bit of butter and a small amount of water if needed. Add wine and cook till mushrooms are soft. Stir in remaining salt and pepper. Now place water and corn starch in bowl and mix well. Pour the corn starch mixture into the pan and bring to a simmer. Return meat to pan and cover. Cook for 30 minutes over medium heat, turning patties every 5 minutes. Remove and serve with extra sauce and any sides you want. 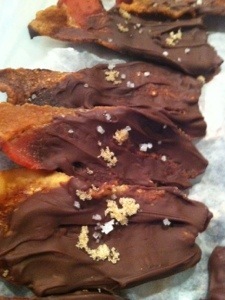 I am always looking for creative after dinner treats that are gluten free and anything different then the norm. After a meat day feast I have with my friends I wanted something that everyone would enjoy. 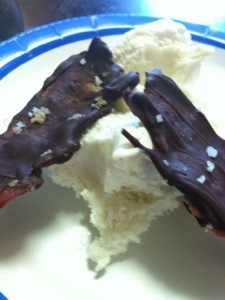 I figured you can never go wrong with bacon or chocolate so I just put it together. It was a huge hit!!! Start by backing cutting all the bacon in half and placing on a foiled cooking sheet. Cook the bacon at 400 degrees for 15 minutes. Once fully cooked allow to cool on a paper towel to help absorb the grease. While cooling, melt chocolate in a microwave in 10 second increments to prevent burning. Now dip each piece in the chocolate and using a spook coat each side with a thin layer. Place on a plate covered in wax paper. Continue to dip each piece until complete leaving the end uncovered to make it easier to work with and allowing some bacon to be visible. Once complete gently sprinkle a bit of salt and sugar on each one. Put plate in fridge for at least 15 min. to harden and serve cold with or without ice cream. Bacon will keep in fridge for up to one week. I have recently learned that blue cheese is something that not everyone likes but I grew up loving it from a young age. 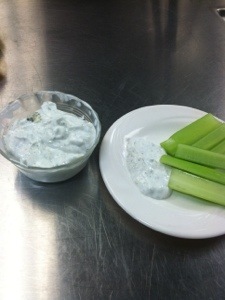 I can’t think of anything better then blue cheese dressing when enjoy a big plate of chicken wings. 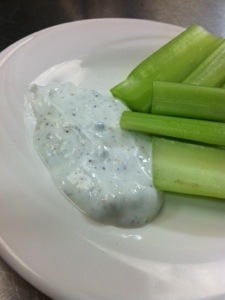 But unfortunately blue cheese dressing is always hit in fat, calories and sometimes not gluten free. My version is just as good, if not better, but slimmed down. Mix everything together well. Consistency depends on presence. If you want it smooth mix and mash well. I prefer lumpy so I just combine everything and leave it alone. Allow flavor to come together in the fridge for at least an hour. Serve with veggies, on salad or with wings. I am always looking for fun ideas for simple entertaining. I always say that finger foods are the hardest to find gf. But with a gluten free baguette on hand it’s easy. 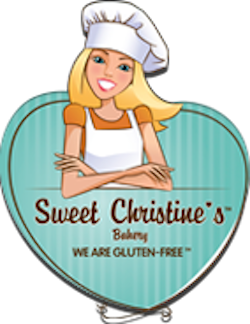 I like Sweet Christine Baguette the best. They ship frozen and can keep for 9 months. Crispy outside and soft inside. 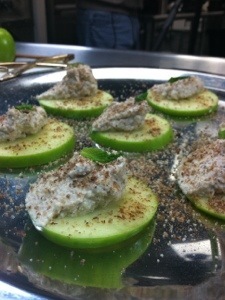 My recipe below is just one of many easy ideas but you can great creative with this. Start by cutting baguette into small rounds an laying out on plate. Then place about 1 Tbs of cream cheese on one half on each slice. 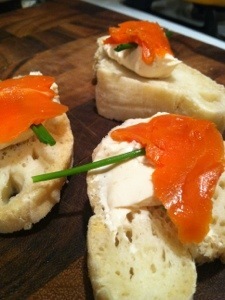 Top the cream cheese with and small piece of lox gently placed on top. Finally slide two pieces of the chives between lox and cream cheese. Enjoy! Another great alternative is goat cheese and orange marmalade. Looking for breakfast sides can be a challenge if you are avoiding bread and potatoes. I always keep cabbage on hand for a simple substitute. Hash is always a classic side so my version is a great replacement. Start by cooking the cabbage down in a pan with water. I just put the lid on cook on a low to medium flame and stir every few minutes. Once it’s soft and more translucent drain from water and set aside. 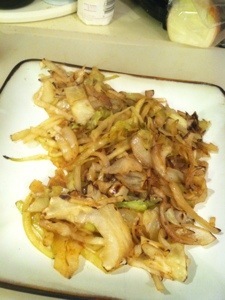 While cabbage is cooking you can slice the onion thin and add to a hot pan that was pre heated with oil or butter. Cook onion until it starts to brown. Now add the cabbage, paprika, salt and pepper. Continue to cook until it is all lightly browned. Serve with eggs for an easy breakfast. I came up with this recipe by accident. A friends of mine just got a grill and is trying to learn some easy recipes. I wanted to come up with something that she would love and was as easy as grilling a burger. This is super healthy and a whole meal in its self. Place cut chicken in bowl and season with salt and pepper. Add BBQ sauce and mix well. Now using wood skewers gently place alternating pieces of chicken, then pepper and then pineapple on each until almost the whole stick is covered. Once you have used up all the ingredients place each skewer on grill and turn every few minutes to cook evenly on each side. Remove from grill and serve. 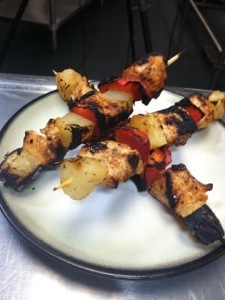 Hint: Make sure to soak skewers in water first to help prevent burning. Also spray grill top well to avoid sticking.